Legal drafting is handled by lawyers as they are knowledgeable about the legal matters that should be written a law-related document. It is basically a creator of texts that are legally binding. For lawyers to be effective in drafting legal documents, they usually study what the courts, attorneys, etc. use as a language when drafting legal documents. They immersed themselves in legal dictionaries to ensure they enrich their vocabulary with the words that they need in getting their message across in a formal manner. Lawyers also seek the help of manuals and books as guides for drafting legal documents. It gives them the ideas on how to best prepare and compose law-related documents. There are a lot of documents that can be legally drafted by lawyers. And there are a number of legal drafting services in Dubai. That can provide the right people and service to you when it comes to ensuring that your documents are free of errors. One of the documents that can be drafted by lawyers is a will or testament. It is a legal document that is made by a person, expressing what he wants to happen in the event that he becomes terminally ill or when he dies. There are beneficiaries included when drafting a will or writing a will. Also, a person names an executor (whether a family member, friend, etc.) who will execute the mentioned legal document when the time comes. This is one of the common things that lawyers do, drafting wills and trust agreements. Because it’s regularly sought by people, there are a lot of will drafting services in the country. The government and even law firms have recently encouraged people to be knowledgeable with regard to will in Dubai and seek help from will writing services to ensure that they are guided in will preparation if they plan to have one. Another thing that lawyers do is drafting Memorandum of Association (MOA). This document is needed in a limited liability company (LLC)’s formation and process of registration. This legal document defines the relationship between an LLC and its shareholders. It shows the name of the company, names of the shareholders, address of the company, and the share distribution. Outsource legal drafting is often done by investors who are looking to have this legal document done, which is the articles of association. Companies have regulations for their operations, and they are all specified and stated in an article of association. Aside from that, tasks are also laid out on an article of association with regard to how they’re going to deal with things, such as appointing directors, issuing of stock shares, handling financial records, paying dividends, etc. Drafting of power of attorney has commonly known anywhere in the world because of the number of people who usually use it. It is a legal document that gives another person (agent) the power to act on behalf of another person (principal, usually the one who makes the POA). Depending on what is stated on a POA, an agent can do a wide spectrum of things, such as making major decisions on a principal’s finances, property, etc. More often than not, POA is used by people when they can’t be physically around to do certain things, if they are ill, or have a disability that hinders them from doing so. HHS Lawyers & Legal Consultants provides legal document drafting service and analysis and documentation services for clients. We know that this is an essential part of the daily work of a lawyer. Whether you are seeking a profundity legal analysis, legal articles, legal research, or draft of memoranda, we can offer a quality service for you. We have experts who are well qualified to handle any type of legal drafting, such as wills in UAE. They are skillful on how to get the job done within a short span of time. 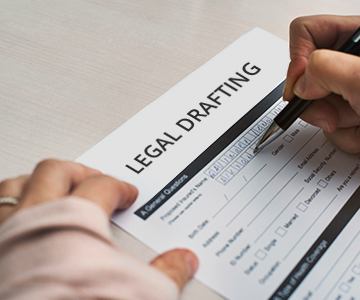 We offer a full spectrum of drafting services for all legal documents and instruments.